ROTC Cadet Jonathan Roman, right, greets role-players who will guide him through a simulated minefield during Operation April Venom, which took place from April 29 to May 2. The role -players acted the parts of host-nation citizens to test the cadets’ cultural awareness and negotiating abilities. ITHACA, NY --- Tempering the leadership mettle of tomorrow’s Army officers was the objective of Operation April Venom, held here from April 29 to May 2. 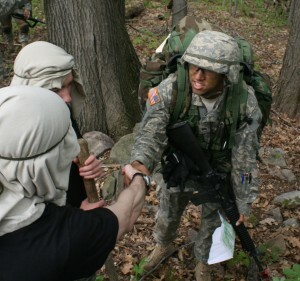 About 140 ROTC cadets took part in the field exercise, which was held at Cornell University’s Mount Pleasant training area east of the Cornell campus. The cadets belong to Cornell’s ROTC program, which includes students from Cornell, SUNY Cortland, Binghamton University, Elmira College, Ithaca College, and the Rochester Institute of Technology (RIT). The exercise was mainly mental for the cadets as they commanded squads and platoons on tactical lanes designed to test their leadership skills and ready them for Warrior Forge, a five-week evaluation course all cadets must undergo before receiving their commissions. The training stressed decision-making -- under the stressful conditions they should expect to encounter in a real-world operating environment. In addition to planning and executing combat missions, the cadets had to react to snipers, mortar fire, casualties, media and civilians on the lanes --- all simulated by other cadets and officers. Dealing with multiple situations teaches cadets to stay focused and not freeze up, said Cadet David Jakubiec, an RIT senior who helped facilitate the training and walked the lanes with cadets. They sometimes have to make decisions with little or no information, he added. The scenario in one lane, for example, called for the cadets to encounter civilians who were mistreating a prisoner, Jakubiec said. Applying cultural awareness and negotiating ability, the cadets were tasked to stop the mistreatment, he explained. “We try to give them situations which force them to apply the Army values and the ethical decision-making process,” Jakubiec said. Cadet leaders were evaluated on their leadership attributes after completing the lanes, including their adherence to Army values, mental agility, response to stress and judgment. The training was great, and taught her to continually look to the next step, said Cadet Kathleen Minor, an RIT junior. They also learned how to adapt Army doctrine to the various situations, she added. “It’s one thing to learn Army doctrine and tactical knowledge, it’s another to apply it in real life,” she said. The ROTC cadets include New York Army National Guard Soldiers like Cadet Hannah Baer, a Cornell sophomore and Cadet Anthony Pedicone, an RIT senior. Baer serves as a medic with the Auburn-based 102nd Military Police Company, and Pedicone is the commander of the rear detachment of the 105th Military Police Company, based in Buffalo. He joined the 105th Military Police Company in 2006, and joined ROTC right after that so he could stay with the unit, Pedicone said. He took command of a platoon within two months, held the position for two and half years and passed Warrior Forge in 2008, he recalled. Leaders can best deal with the simultaneous situations by focusing on the objective and effectively using subordinates, Pedicone said. He’s learned to rely on NCOs, who have knowledge and experience, he added. Baer originally joined the Virginia Army National Guard and recently transferred to the New York Army National Guard. She enlisted to pay for college, but came to enjoy learning leadership skills and responsibility, she said. “I like it a lot more than for just college,” Baer said. As a team leader on the lanes, she felt stress and worried about making the right decisions, Baer said. But that was what the training was all about, she added.